There was no looking back. There was no looking back. Meenakshi Vinay Rai seemed worried about the future. She was carrying her first baby to who she could give birth anytime. The lack of a proper hospital in Viratnagar town in northern Jaipur district of Rajasthan, where she was working with the banjara nomadic tribes, gave her the chills, but she hung on to willpower like her only hope. She had not come this far to only come this far. The banjaras told her they would help her deliver in the open. She wasn’t reassured but she trusted them nonetheless. In a few days, Meenakshi gave birth to a healthy girl. She and her husband, Vinay, who work together as film-makers, named her Shruti, meaning pure sounds. These stood as echoes of nomadic assurances given to them that said, ‘nature never fails you when you surrender with trust’. 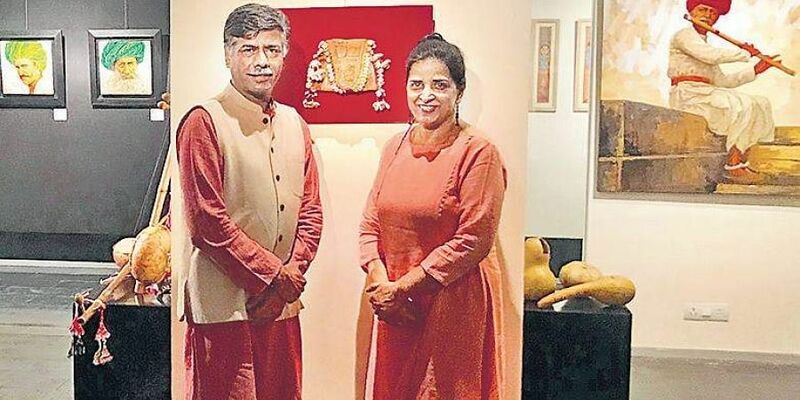 A sliver from this repository of trust that the couple collected in the form of artefacts, textiles, weapons and tools, is on showcase in an exhibit called Romancing Nomadism, by Chinh India, of which they are the founders, along with Art Spice – The Art Gallery. The Morpankhi stitch is one of the most important aspects of the display, Vinay tells us. It’s the pride of Banjara women. On view is a 50-year-old bag with this ancient stitch. These bags are used during marriage ceremonies. 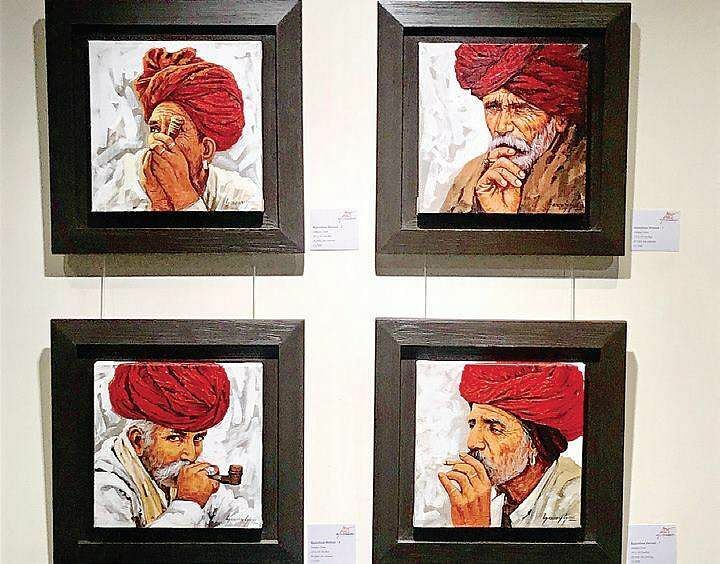 In the backdrop of the sketches, instruments and paintings, are sounds of Suraj Bhopa of the Bhopa community. Meenakshi wrote poetry for this and Suraj sang the song. “We have always been absorbing folk into Bollywood but we’ve not filled folk back. To enrich the folk map, we wanted to work with these artists and empower them,” she says. Since he could not read or write, Vinay helped him understand the poetry, while Meenakshi explained the feelings behind it. Suraj was allowed to sing it his way using the ravanhatta, which is a dying instrument. Today his music CD called Jab Nahi Rahu Mai earns him money and respect. As national award filmmakers, the two of them are using the platform provided by the Art Spice to facilitate yet another kind of conversation between the nomadic communities and urban dwellers. The exhibition intends to make them more relevant. All profits from the show will go back to these communities. An interface between the two was important. “The nomadic community never wanted to share their culture in the first place. We explained to them that people in city cultivate hobbies and they will use their instruments to learn an art form. We decoded their instruments in the form of workshops and by introducing them into school curriculums,” says Meenakshi. Some of these are on display, one such being the bhapang. Made of a dry hollow shell of a pumpkin, the couple created a prototype of it with Mango wood for children to learn playing it without having to worry about it breaking. Both, the original one and the Mongo wood variation is on display. It is an anger absorber, Meenakshi tells us. With its frequency of the 170 hertz, its calming frequency is used in therapy. On one of them, you’ll see Pabuji Bhopa’s image. He is a 16th century deity in whose praise the instrument is played. There are series of portrait paintings, one of them being of green turbaned banjaras, and another one of red turbaned rabaris. A 150 year old bow, as well as a traditional weapon called mogri have been included. The one of being exhibited is made of kala khair and is the only rare piece left in the hamlet of Mamraj Banjara from the Aravali region. There are a couple of ektaras or one-string instruments, in addition to a nomadic drum. 2008 was the breakthrough year from the couple who established diplomatic links between nomads of India and other tribes of the world, through music and culture. This gave birth to a project by the name of Nomadic Orchestra of the World. All the sounds reverberate one message—that of coexistence—the only way cultures and communities of India can create value through inclusion and acceptance. Romancing Nomadism fosters that idea through art. On till October 25: 9 am to 6 pm, The Metropolitan Hotel and Spa, Bangla Sahib Road.